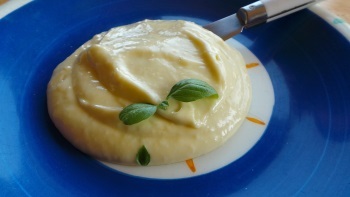 A unique use for garlic was as the base for emulsion condiments and sauces made by pounding the garlic and incorporating olive oil. The first apparent mention of anything resembling allioli is in the writings of Pliny the Elder (A.D. 23-79), who was a Roman procurator in Tarragona, on the Catalan coast, for a year and writes that when garlic is "beaten up in oil and vinegar it swells up in foam to a surprising size." There is no doubt in my mind that mayonnaise was an evolutionary development from allioli. Whether all of the emulsions known throughout the Mediterranean are derived from this ursprung is less certain. There is a good possibility of serendipitous culinary invention. Unlike the aÃ¯oli of Provence and the aillade of Languedoc, the true Catalan allioli (all, "garlic," i, "and," "oli," oil) is made without eggs, using only garlic, olive oil, and salt. The garlic is placed in a mortar with salt and pounded until completely mashed and smooth. Then olive oil is slowly drizzled in, almost drop by drop, as the continued pounding incorporates the oil into an emulsion with the garlic. This is quite an undertaking, and I wish Colman Andrews had written his classic Catalan Cuisine before I slaved away trying to make the authentic allioli. He confirms that this is very hard to do and tells us that "the region's most famous chefs openly admit that they can't get the damn thing to work." He also confirms, as I suspected, that allioli is regularly made with eggs today, and this is the recipe I give you. 1. Mash the garlic and salt together in mortar until it is a paste. In a food processor, process the egg for 30 seconds. 2. Add the garlic paste to the food processor and slowly drizzle in the oil until absorbed. Cover and refrigerate for 1 hour before using. Keep refrigerated for up to a week. This well-researched book [Mediterranean Vegetables] on vegetables is full of wonderful recipes from the cuisines of the world and is a great reference work.